Whenever I see a place that claims to have great tapas, I get a little suspicious. Sure, tapas in their traditional Spanish state—small, composed dishes that are more concerned with flavor than portion size—are awesome. But a lot of restaurateurs have seized upon the term's popularity as a way to serve smaller portions of whatever they want—Spanish or otherwise—at higher prices in order to maximize profits. After reading up on Café Madrid (5244 S. Highland Drive, 801-273-0837) before my maiden visit, its list of traditional Spanish dishes and overall focus on Spain's authentic cuisine helped abate my skepticism a bit, but you never know until you go. Café Madrid's longevity as a traditional Spanish restaurant is one aspect that made me think twice about my cynical view on its tapas game. The restaurant has been around since 2003, when it opened in the Black Diamond retail center on 3900 South. In 2011, owners Gabrielle and Todd McAfee built a new home for Café Madrid from the ground up on Highland Drive. These days, it's rare to visit a local restaurant that isn't occupying a previously owned space, and it's easy to see that the owners were keen on capturing the right Old-World Spanish vibe as they were building the café's new digs. Even though the well-maintained patios and gallery of local art helped abate my initial trepidation, I wouldn't be convinced until I perused the menu and ordered the most tapas-y of all tapas—the albóndigas. I have had iterations of this Spanish meatball several times, and they almost always taste like the same spongy junk found slumming around in a can of SpaghettiOs. Café Madrid's albóndigas caseras ($13) are made from veal, pork and beef, which can be a dangerous combination if your ratios aren't right. After my first bite yielded a tender, nuanced bit of Spanish gastronomic history, my doubts were effectively obliterated. These meatballs are prepared to let the diner fully taste and appreciate all three types of meat—and they're served in a savory but slightly sweet gravy that perfectly complements their flavors. Per our server's suggestion, we ordered one of the seasonal chilled soups called sopa de ajo ($9), a cream-based, chilled garlic soup that is poured tableside over a bed of red grapes. Chilled soup and I have never really gotten along, but I must say that this one was tailor-made for our crispy Utah summers. I was expecting the garlic to be overwhelming, but it's nicely tempered by the creaminess of the soup. A pop of red grape adds welcome sweetness and texture—it's one of the most pleasant culinary surprises that I've had in a long time. Moving into the entrée section of the menu, diners are treated to a gorgeous confetto of Spanish dishes with lengthy and romantic titles. The solomillo de buey al queso picón de Treviso ($30) is a grilled beef tenderloin served with root vegetables and slathered in a Roquefort cheese sauce—ideal for the steak lover in your life. Roquefort and grilled beef are a classic pair, but whipping that piquant blue cheese into a nice brown gravy is a game changer. Instead of getting a little crumble of cheese here and there, this stuff permeates the tenderloin, honoring that tried-and-true flavor combo with every bite. Then there's the fideuà ($20), a saffron-infused pasta dish served with shrimp, mussels, clams and calamari. It's warm and comforting, but I couldn't help but feel like its purpose is to prime diners for Café Madrid's signature paella. Ordering the famed rice dish here is an event unto itself. It's a slow-cooked endeavor, so if you want a full dish for two ($40), the kitchen staff requires at least a 24-hour notice. Diners can preorder it online and should also make a reservation for the applicable time (the dish can also be prepared for carry-out). Admittedly, my wife and I were excited to sit down at our table knowing that the chefs were putting the finishing touches on a gigantic skillet filled with rice, seafood, chicken and more, made to order just for us. 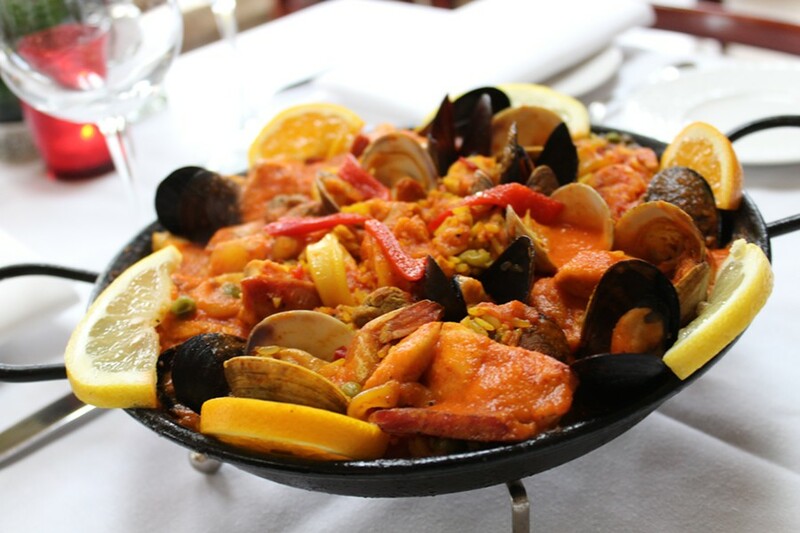 The paella is easily enough for two hungry diners, and it is a beautiful combination of textures and flavors. With its list of ingredients including heavy hitters like saffron, chorizo and mussels, it manages to maintain a harmony of seasonings that make sure each flavor is properly balanced. For those who share my cynical bias toward places that refer to themselves as tapas bars, but still love the concept of true Spanish small plates, Café Madrid will make you a true believer. It might not be the cheapest place to order up a round of tapas, but it definitely ranks as one of the most authentic. Fri. 11 a.m.-3 p.m., 5 p.m.-10 p.m.; Sat. 5 p.m.-10 p.m.